KS WebFile is a FREE online application for filing Kansas Individual Income tax returns. Refunds can be deposited directly into your bank account. For a balance due, payment methods are electronic check or credit card (MasterCard, Discover or American Express). KS WebFile is your safe, secure, fast, free and paperless way to file! Click here to file your Income Tax return now. Homestead WebFile is a FREE way to file Homestead claims. Like KS WebFile, refunds can be deposited directly into your bank account. Homestead WebFile is safe and secure. While all claim requirements must be met and information verified, filing electronically can speed up the refund process. File your Homestead claim now by clicking here. 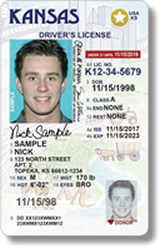 If you are a veteran and can provide your DD-214 you may chose to have the veteran indicator displayed on your driver license or identification card. This will be displayed on all license types and identification cards for real ID or not for federal use credentials. If you have a tax bill that is past due, you can now pay your debt or set up a payment plan online through our new Webportal. It’s part of our agency wide work to make services more accessible and convenient for the people we serve. 2019 H.B. 2035 amends K.S.A. 2018 Supp. 41-308 to provide that all alcoholic liquor, cereal malt beverage and nonalcoholic malt beverage sold by a holder of a retail liquor store license shall be subject to the liquor enforcement tax imposed by K.S.A. 79-4101. This change went into effect on April 11, 2019, the date the act was published in the Kansas register. More notices, handbooks, forms, and other important information available here. How do I apply for a pay plan? The Kansas Department of Revenue may consider a payment plan agreement for taxpayers to resolve their accounts if certain criteria are met. In accordance with Kansas statute, the department will charge a $25 payment plan administration fee on all approved payment plans exceeding 90 days. Go to the pay plan page for more information. Do I qualify for a homestead refund? To see if you qualify for a homestead refund, go to our homestead refund information page. Can I pay my drivers license reinstatement fee online? Yes, you may pay your driver's license reinstatement fee online, if your driver's license was suspended due to an insurance matter. Driver's license reinstatement payments will be accepted through KanPay Service Express and forwarded to the Division of Vehicles, Driver Solutions Bureau for processing. Payment is accepted by all major credit cards and by echeck. You will be charged a non-refundable convenience fee for use of this service. To make your payment, click here and you will be redirected to KanPay Service Express. This payment service is only for the payment of insurance related reinstatements. You may not pay for traffic tickets, motor vehicle records or alcohol related reinstatements through KanPay Service Express. Can I get a driver's license if I am under 21? Visit our page containing Under 21 License Information. Whether you are beginning your career or thinking about a career change, consider joining the Kansas Department of Revenue team. We offer competitive salaries, benefits and professional development opportunities. For information about the state employment process visit https://admin.ks.gov/services/state-employment-center/sec-home or email KDOR_Recruitment@ks.gov. See all Department of Revenue jobs here. For general tax questions or issues, please contact the Taxpayer Assistance Center Monday - Friday, 8 a.m. to 4:45 p.m., at 785-368-8222 or by emailing them at KDOR_tac@ks.gov. This site contains certain limited statistical and financial data relating to activities of the Kansas Department of Revenue of the State of Kansas and has not been prepared or maintained as a source of investor information and should not be relied upon for investment purposes.